I’ve been waiting all week to post these bad boys. This past weekend, Husband and I hosted my parents. Normally, this is a good excuse to shuttle off to that restaurant we’ve been dying to try but can’t quite justify the expense…but since my parents were coming off a 3-day Civil War/college reunion tour, they wanted some home-cooked food. Enter sandman Deb Perelman. Tip: next time your parents are coming off a 3-day Civil War tour (I’ll let you all ponder that in your heads. Parental units hopping on and off a bus, checking out battlefields, dressed in orange and/or tiger stripes, chanting about Old Nassau. My dad , the civil war buff, bopping about in his Abe Lincoln t-shirt. My mom, the bewildered German, wondering when the part is when she gets to see her kids. Makes me giggle.) make them this. Comine all of your meatball ingredients in a large bowl. Mix thoroughly, using your hands, but do not overwork the meat. Shape the meat into little golf balls. Heat a little bit of olive oil in a large saute pan and brown the meatballs. Do not overcrowd the pan. On a large pan covered with aluminum foil (to make your cleanup easier! 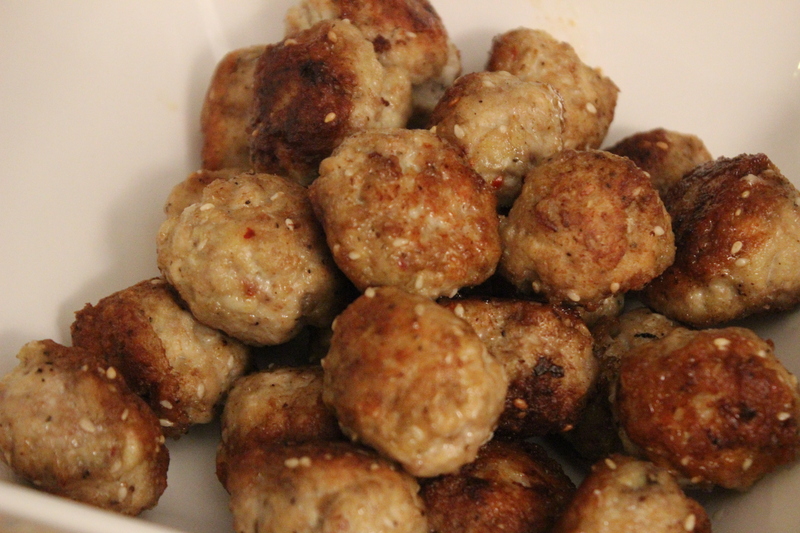 ), bake the meatballs for about 10 – 13 minutes. Meanwhile, get your smashed chickpea salad going. Combine all of the chickpea ingredients in one bowl, minus olive oil. Mash (a potato masher works well!) together – leave it a big chunky. Drizzle with olive oil and season to taste. 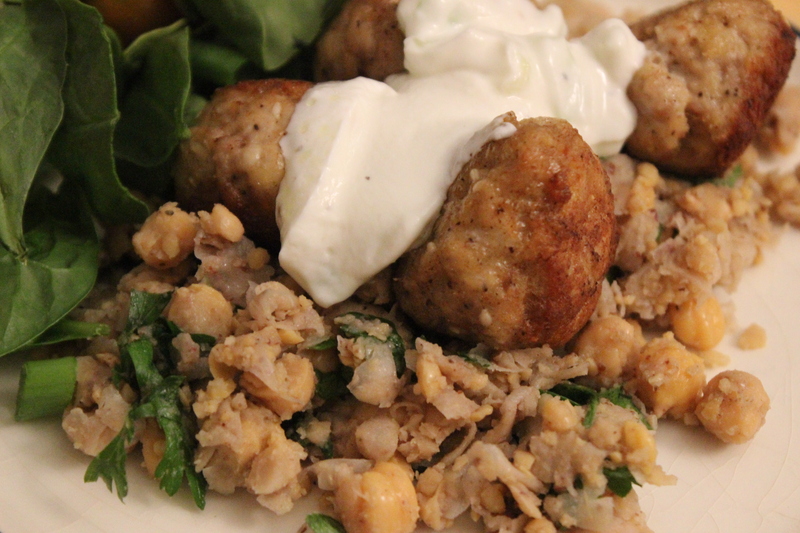 Finally, mix all of your tzatziki ingredients together in another bowl. Season to taste. Serve everything together, all at once, and let the praise wash over you like a college fight song. I know it LOOKS like a lot, but if you have the ingredients, this is easy-peasy and oh-so-good. Mom, Dad & Husband all raved about this little combination, which we also served with salad and pita bread…tiding us all over until the next Civil War battlefield tour.